One of the unheralded groups who have done so much for the community and the Dunedin Amenities Society is the Dunedin City Council sponsored Task force Green and Community Volunteers. No matter what the job this group of people are willing and able to put in the effort for the good of the community and its citizens. The Dunedin Amenities Society have had the pleasure of having many of their number undertake a range of work on its projects, always with excellent results. Well led, well organised and always willing, this group have proved invaluable in Dunedin for many years. Recently the Society had six volunteers undertake road marshaling on the Town Belt Traverse. They gave up their Sunday to help our organisation put on a great event and keep people safe. You can’t place a value on that kind of assistance, and the Society would like to publicly acknowledge the team and wish them well in all of the things they do for our great city. (Click on pictures to view in full size). Morgan – leader of the pack! 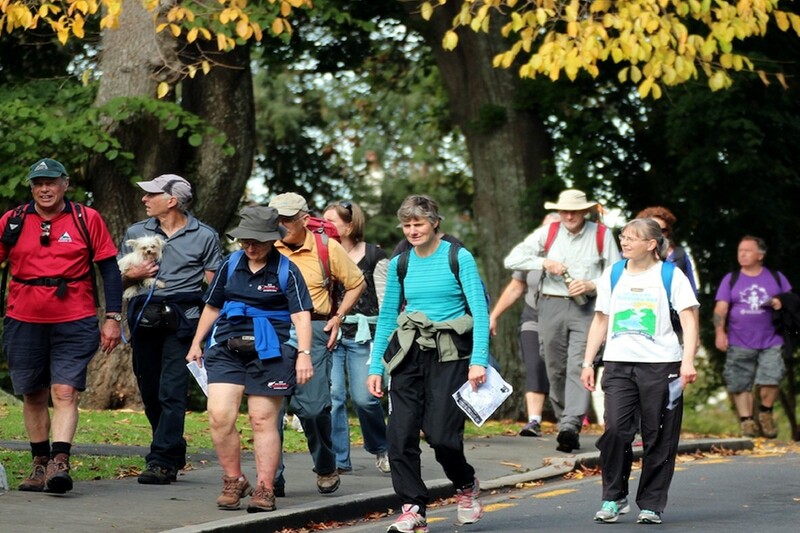 To paraphrase Tennyson “into the Town Belt walked the 600” on Sunday 29th March for the Dunedin Amenities Society’s second Town Belt Traverse event. 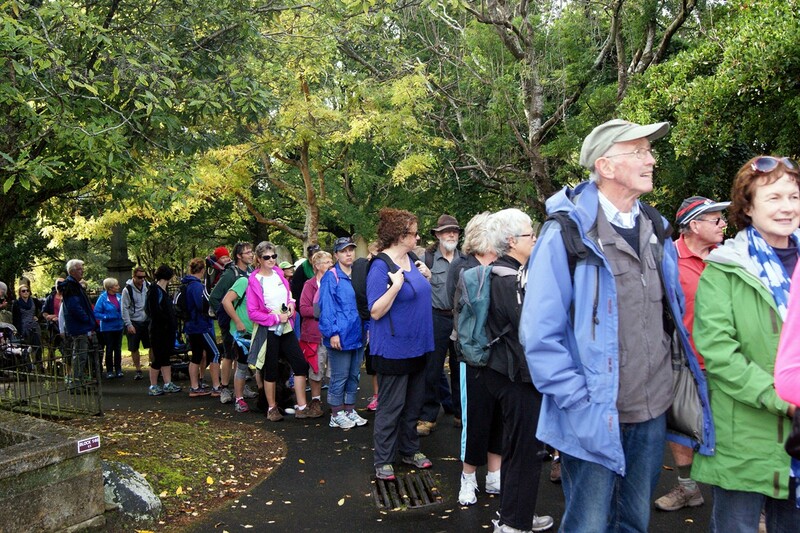 The Society was overwhelmed and humbled by having 600 people of all ages wanting to explore one of Dunedin’s great heritage landscapes and explore the 8.2 kilometre course. The addition of the 10 interpretation signs along the course gave information on the history of the reserve and were a welcome addition for the walkers that many found informative and interesting. This year also saw the involvement of different groups at the stopping points including the Air Training Corps and members of the local military vehicles club at Unity Park. Perhaps one of the great surprises for many walkers was an opportunity to visit the Beverly Begg Observatory at Robin Hood. Other highlights included a visit to the beautiful gardens at Olveston and live poetry at the Charles Brasch memorial at Prospect Park. However, the star of the show was the beautiful Town Belt, with its splashes of autumnal colour, native bird song, city views and the lush native bush bathed in a sunny March day. All of these things made the reserve really shine. At Woodhaugh the Society was rushed off its feet feeding hungry walkers and our thanks must go to the great help we received from the ladies from Portobello School who ran the barbecue. The Traverse was also an opportunity to announce its “Project Gold” partnership with the Department of Conservation. Department staff were really pleased to be able to promote the project and interact with the walkers as they finished the route. Project Gold was established by the Department of Conservation to encourage the revitalisation of local areas with the iconic Kowhai tree. The Society will contribute $1500 per annum for the next 5 years for suitable kowhai planting projects in the Town Belt which will assist in adding new areas of the endemic tree important for wider bird feeding and connectivity in the reserve. The planting of a large specimen tree by Society Chairman Robin Hyndman and Annie Wallace the acting Director of Conservation Partnerships cemented that partnership. My what big toadstools you have. Well done – keep going! My house is over there! Thank you to the following businesses and organisations for their support of prizes for the Town Belt Traverse. Olveston, Moana Pool, Ribbonwood Nurseries, Taieri Gorge Railway, Monarch Excursions, Otago Museum, Cadbury World, Larnach castle, Blueskin Nurseries, Orokonui Eco-Sanctuary, Royal Albatross colony, Nichols Garden Centre, Speights Brewery, Pukekura Penguins, Arthur Barnetts, Coupland Bakeries, Ironic Cafe, Torpedo 7, Cycleworld, Bakers Dozen, and MTF, Speedy signs and Mitre 10 Mega Dunedin. Thanks to those sponsored adverting. Bayleys, Slick Willys, Dunedin City Council, The Orchid Florist, Albert Alloo & Sons, Arrow International and Action Engineering. Thanks to those organisations that have assisted the Society in organising the Traverse. Task Force Green, Dunedin Rotary, Air Training Corp, Dunedin Astronomical Society, Olveston, Our Poets – David Howard, Alan Roddick, Shae MacMillan, and Carolyn McCurdie, Lyn and Rachel from Portobello School, and the Department of Conservation. 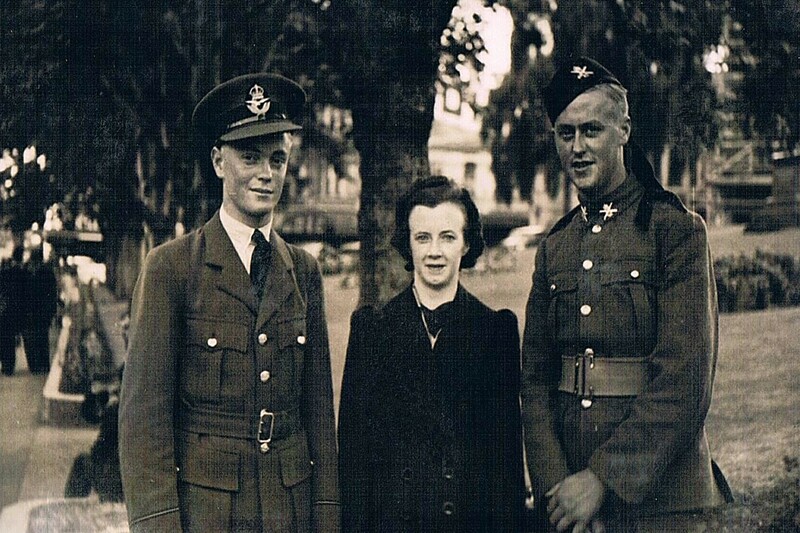 The Dunedin Amenities Society will combine with Rotary and Olveston to develop a memorial site on Queens Drive commemorating the contribution made to the city by the late Les Cleveland. The project will include seating, a memorial and drift planting of daffodils alongside the Olveston stately home. Planting of the daffodil bulbs on site will commence on Saturday 21st of March at around 9.00-9.30 am. Volunteers who wish to assist with the planting of the bulbs should bring a spade or suitable pry bar for opening up the ground. 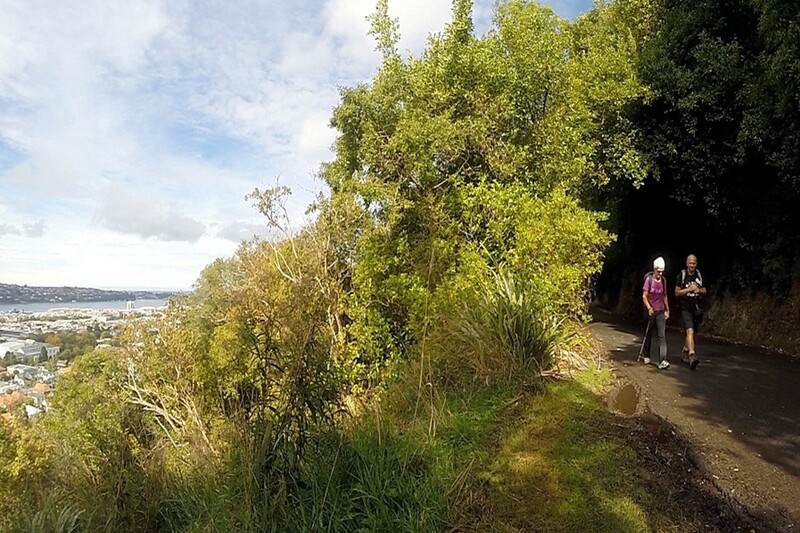 Les Cleveland was a generous and passionate benefactor to Dunedin and his love of people and plants can be seen across a wide variety of areas in Dunedin. In the 2014 Annual Plan deliberations a proposal to create part of the Octagon and lower Stuart Street into a pedestrian precinct was submitted by two Otago University students . That plan has gained momentum within the City Council, with the announcement of an investigation into developing the idea as a trial. Now in July Councillors have requested Council staff report back on October 28, with public consultation to follow and a final decision to be made in January 2015. 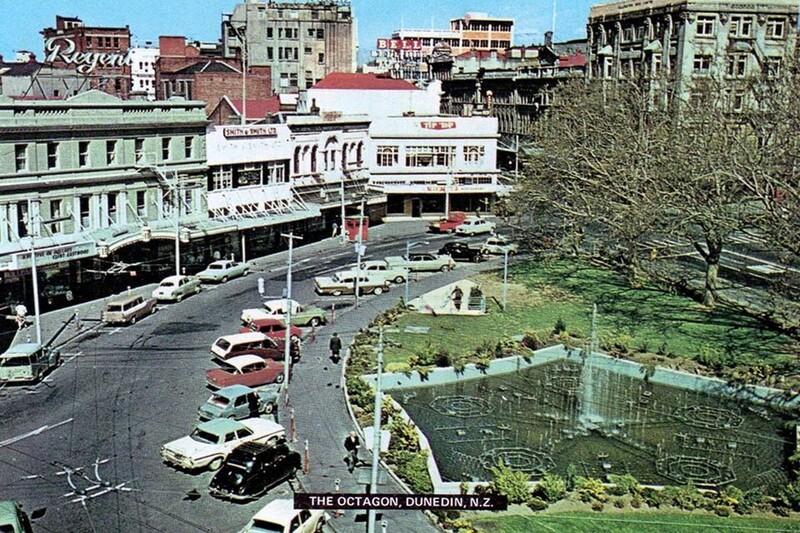 The development of the Octagon as a pedestrian precinct is not a new proposal and has been debated in Dunedin on a number of occasions. The Octagon lies at the heart of Dunedin and its physical shape and central location make it an important civic open space within the central city. As an open space it has been the subject to considerable change since its initial layout during Charles Kettle’s survey of the city in 1846. 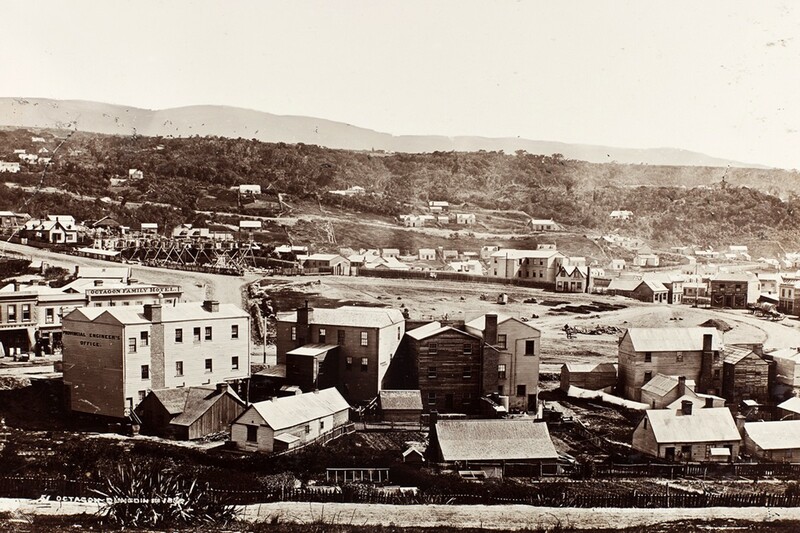 The importance of the central location of the site was recognised very early in Dunedin’s development and in 1854 the Dunedin Public Lands Ordinance proclaimed that it “shall not be lawful to erect any building whatever within or upon the centre area of the Square called Moray Place, …except a parapet wall and railing, or fence, for enclosing the said area, which shall for ever remain otherwise an open area.” While the name Octagon was never formalised it became part of popular use in Dunedin probably because of the shape of the adjacent formation of Moray Place and its thoroughfares in Kettle’s original layout. In 1864 the first monument was erected in the Octagon with the construction of Cargill’s monument to commemorate William Cargill the first Superintendent of Otago. Built by Australian John Young in Melbourne some of the stone for the monument was from a quarry opened up in the Town Belt for the Exhibition building. The monument was later moved to its current position in the Exchange in 1872 to allow for better road access to connect George and Princes streets. In 1887 the current statue of the poet Robert Burns was unveiled in the upper Octagon. 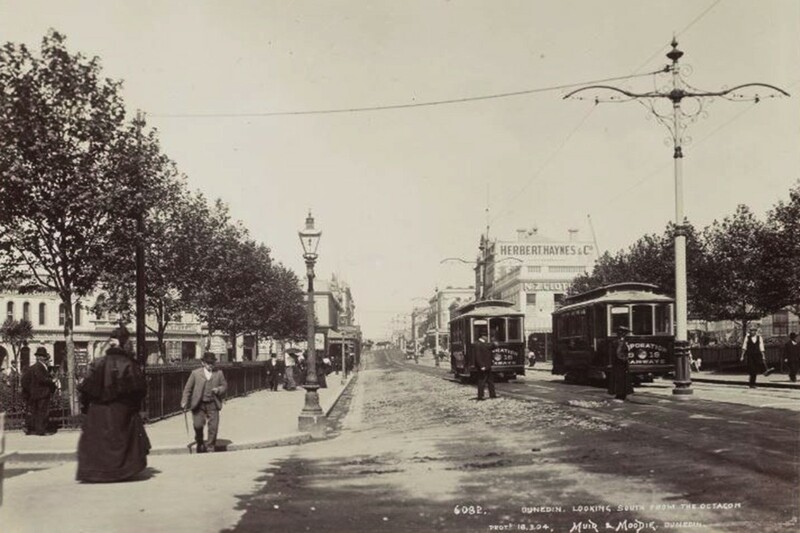 With the foundation of the Dunedin Amenities Society in 1888 a plan for improving the Octagon was developed and implemented by the Society from 1890-1892. Through public subscription and fundraising the Society completed the planting of the London Plane trees seen in the Octagon today. Ornamental fencing, seating and further planting was also undertaken as part of the Society’s development of the space. The completed improvements by the Society coincided with the construction of the Thomas Burns memorial as a gift to the city by Robert Chapman in 1892. However, the memorial was generally unpopular and was later removed from the Octagon in the 1940’s. 1966 saw the completion of the Star fountain in the Octagon after the Evening Star newspaper donated £5,000 to the City Council. The fountain was a popular attraction in the city, but by the 1980’s it had become unsightly and during the refurbishment of the Octagon in the early 1990’s it was removed. There was significant public outcry about its removal and the new design initiated by the City Council. The Octagon has evolved into a much-loved public space in Dunedin that has combined civic pride, local identity and a strong sense of public ownership. The public’s collective ownership of the Octagon as an open space is deeply entwined in personal and civic history that defines both the identity of individuals but also the city. The legal protection of the Octagon and its links to Kettle’s survey also makes it central to the historic and heritage narrative of Dunedin. That makes any future development of the Octagon an issue that will have high public expectations on a physical, aesthetic and historical level. With its impressive architectural backdrop and linkages to the wider heritage values of the city its importance cannot be understated. 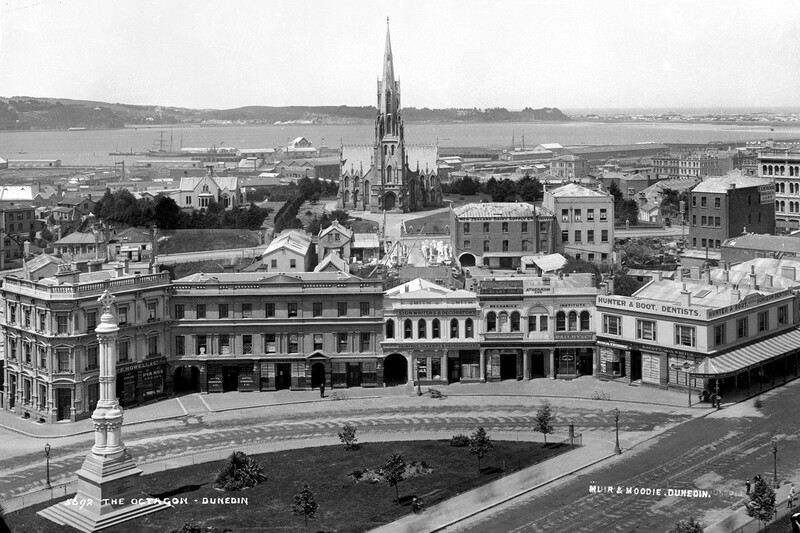 The Octagon has largely become an identifiable symbol of the city and a defining structural element in the built landscape of Dunedin. The City Council needs to make careful and considered decisions about the nature of the public space in the area that recognises the affection that residents have for the Octagon. As a major contributor to the historical and aesthetic values of the Octagon the Society will watch with a keen interest as this proposal develops.